The importance of having an accurate, complete and accessible court record cannot be overstated. The official record provides a fundamental building block for the judicial system, providing transparency for the public, accountability for the judiciary and the possibility of a meaningful appellate review for the losing party. 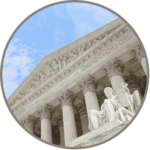 An accurate, fully reviewable record builds respect and legitimacy for the court system, promotes accountability for court participants that may behave abusively, and enhances court effectiveness. At its core, the existence of a verbatim court record supports the due process of law and ultimately the assurance of justice. Yet despite the importance of the court record, there are different kinds of court records used currently with varying degrees of effectiveness and cost, from the notes of judges or clerks (often used in developing countries), to transcripts from court reporters and full audio/video recording of the proceedings. There are even some “courts not of record” that still function in the United States, where no verbatim court record of all that transpires in the courtroom is kept and the possibility of meaningful appellate review is severely compromised. Courts of record can turn into de facto courts not of record when no court reporter is requested to cover the proceedings (usually because the litigants cannot afford a court reporter). Despite advances in technology that make audio/video recording in the courtroom an easy and relatively inexpensive option, accurate and accessible court records are still not made in every courtroom for every case. 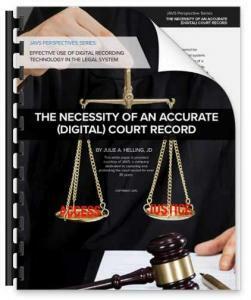 Looking at both the conceptual and legal reasons for a record, the use of digital recording technology can serve as a critical solution for a truly transparent and accessible court record.